Abstract. In the last few years the method of cosmic-ray neutron sensing (CRNS) has gained popularity among hydrologists, physicists, and land-surface modelers. The sensor provides continuous soil moisture data, averaged over several hectares and tens of decimeters in depth. However, the signal still may contain unidentified features of hydrological processes, and many calibration datasets are often required in order to find reliable relations between neutron intensity and water dynamics. 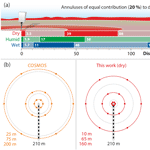 Recent insights into environmental neutrons accurately described the spatial sensitivity of the sensor and thus allowed one to quantify the contribution of individual sample locations to the CRNS signal. Consequently, data points of calibration and validation datasets are suggested to be averaged using a more physically based weighting approach. In this work, a revised sensitivity function is used to calculate weighted averages of point data. The function is different from the simple exponential convention by the extraordinary sensitivity to the first few meters around the probe, and by dependencies on air pressure, air humidity, soil moisture, and vegetation. The approach is extensively tested at six distinct monitoring sites: two sites with multiple calibration datasets and four sites with continuous time series datasets. In all cases, the revised averaging method improved the performance of the CRNS products. The revised approach further helped to reveal hidden hydrological processes which otherwise remained unexplained in the data or were lost in the process of overcalibration. The presented weighting approach increases the overall accuracy of CRNS products and will have an impact on all their applications in agriculture, hydrology, and modeling. How to cite: Schrön, M., Köhli, M., Scheiffele, L., Iwema, J., Bogena, H. R., Lv, L., Martini, E., Baroni, G., Rosolem, R., Weimar, J., Mai, J., Cuntz, M., Rebmann, C., Oswald, S. E., Dietrich, P., Schmidt, U., and Zacharias, S.: Improving calibration and validation of cosmic-ray neutron sensors in the light of spatial sensitivity, Hydrol. Earth Syst. Sci., 21, 5009-5030, https://doi.org/10.5194/hess-21-5009-2017, 2017. A field-scale average of near-surface water content can be sensed by cosmic-ray neutron detectors. To interpret, calibrate, and validate the integral signal, it is important to account for its sensitivity to heterogeneous patterns like dry or wet spots. 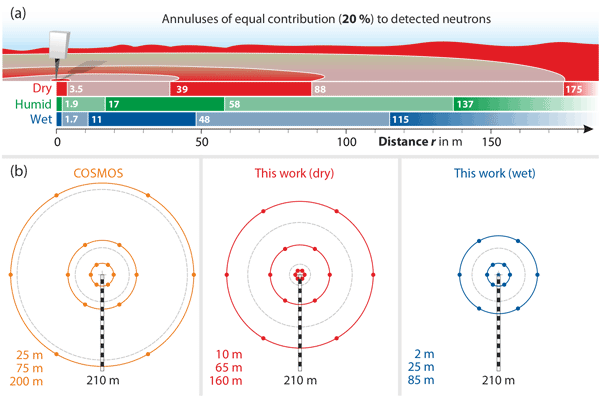 We show how point samples contribute to the neutron signal based on their depth and distance from the detector. This approach robustly improves the sensor performance and data consistency, and even reveals otherwise hidden hydrological features.